Thanks so much for all of the kind words about my tie-front tote bags from my last post! Don't forget, there are still a few days to enter for your chance to win a free e-course from Trish Preston of Two Peas in a Pod. Just head over to my post on the Fat Quarterly blog to enter. I'm sitting in the waiting room of my local Honda dealership waiting for my minivan to have its oil changed, so I figured it was a good time to catch up on some recent quilting bee blocks that I've made. Here they both are together. I hope you like them, Rebecca! 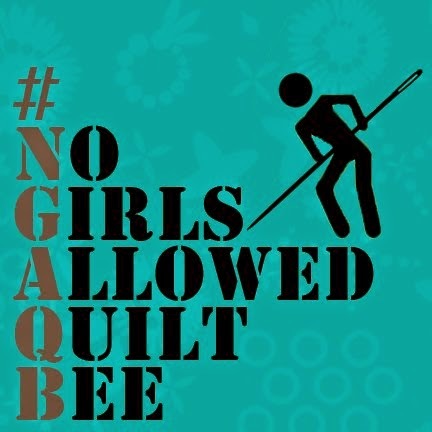 I joined a new virtual quilting bee that started in January. It's called the Free Bee and I was invited to join by the fabulous Lynne of Lily's Quilts (and also of Fat Quarterly, of course.) The bee is placing its emphasis on free and improv piecing. Really, how could I refuse? 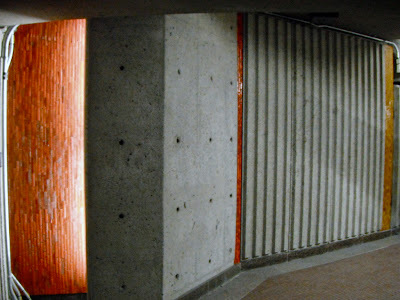 Krista of Poppyprint kicked us off in January and posted this AMAZING photo as her inspiration. 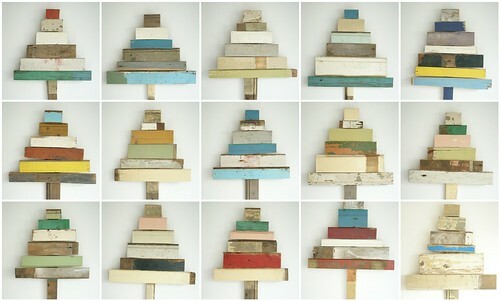 I just fell in love with it -- it has such a modern, faded, beachy driftwood-type feel to it, doesn't it? 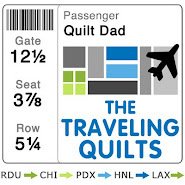 I'm holding on to this one for future quilt ideas. I had a great time shopping for new fabrics for Krista's quilt, and wound up buying a whole lot more than I needed for just three quilt blocks. So stay tuned .... you're going to see these fabrics again! 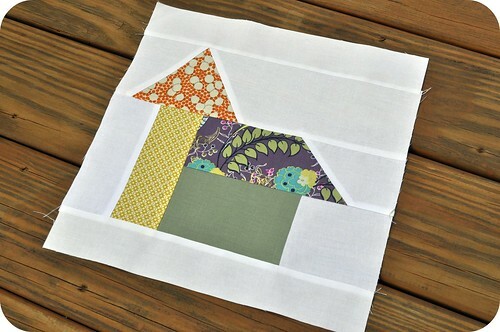 Can't wait to see Krista's quilt come together! OK, ready for February? 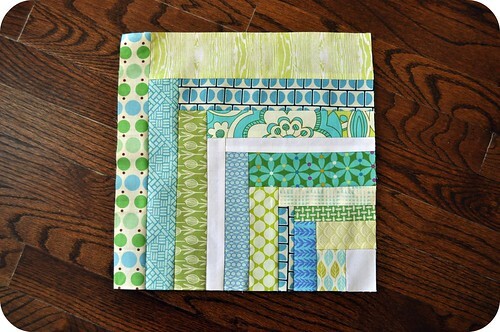 Back over in Bee Tweet, Leigh sent a really great assortment of fun blue and green prints and asked for quarter log cabin blocks inspired by Nettie's Square Deal quilt from the Block Party book. ... and two more small 6.5' blocks. 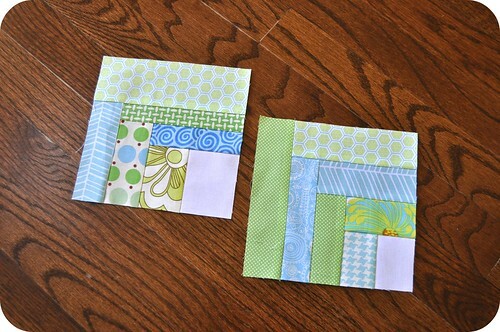 As you can tell by the number of blocks I made for Leigh, I had a great time making these! Things began to get challenging over in the Free Bee in February. The group is chock full of some amazing artists and quilters -- and I use those two terms together, because the bee sometimes drifts closer to the realm of art quilts than I've even been comfortable with before. 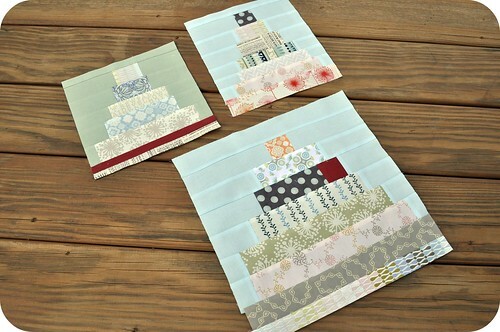 Case in point: for February, Marianne requested urban industrial blocks inspired by the work of art quilter Elizabeth Barton (here's a gallery that Marianne set up, and here's another set of urban inspirational photos). Gorgeous, for sure, but how could I pull this off? Elizabeth's work is a far cry from what I am used to making. But that's what I love about this bee -- the opportunity to push myself into new areas of creativity that I haven't tapped into before. I went heavy on the texture with some Moda Cross-weave fabric in grey and tried to add some urban grit by adding in Grunge solids in yellow and orange. 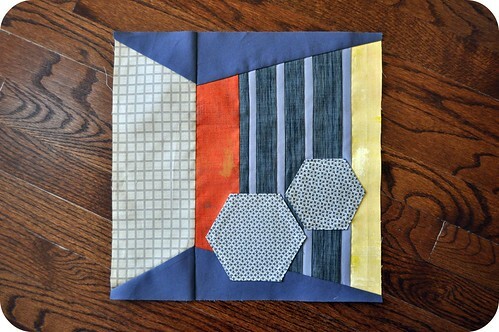 I attempted to give the block some dimension and, for fun, stitched on a few hexagons to represent industrial cogs. You should definitely check out the other blocks that people are making for Marianne -- I'm truly blown away by the skill and creativity in this group. And wait until you see what I need to make for this bee in March ... eeeeek! 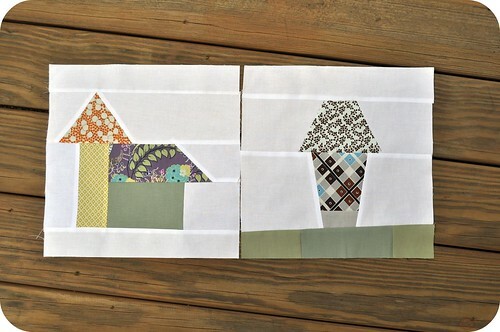 I love those house blocks going to have to make a few. Love my three fabulous blocks John. Thanks for being so generous! I am also appreciating the free bee challenge and look forward to the curvy strips ip next! You've been busy...great blocks. 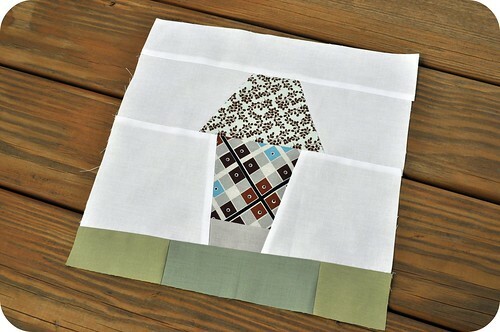 Your Urban Inspired block has arrived and looks great. Thanks again. Would you mind if i put a link with your blog an mine? I would be happy about that. They look like wedding cakes! I like that idea. Interested in how they are going to come together. That's exactly what I thought! LOL! 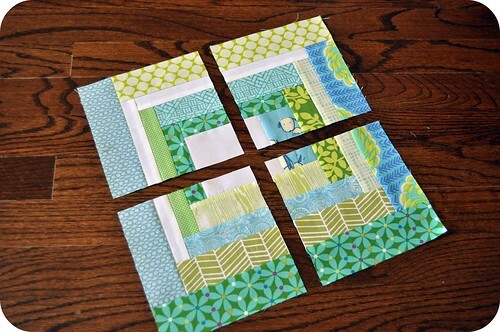 I was thinking that the blocks would make a nice Christmas quilt if you left the little stem at the bottom. 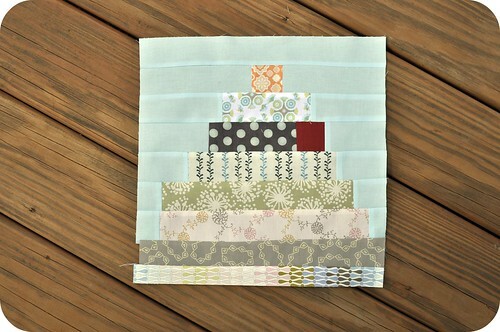 The blocks you made for Krista's Quilt look like wedding cakes, YUM! 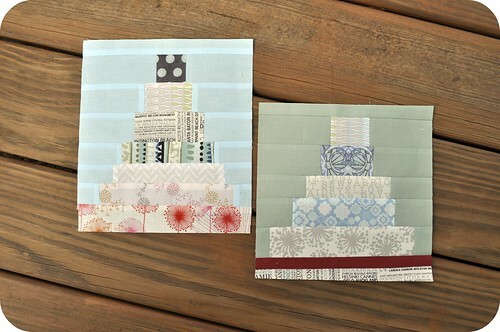 I think the stacked blocks look like wedding cake!!! Way cute! !